Thank you everybody for tuning in to my very first solo podcast adventure! 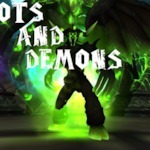 DoTs and Demons is a warlock based podcast dedicated to the best spellcaster class in World of Warcraft! In this very first episode, Mykurse works on shaking off the cobwebs and indulges on his Alpha experience so far!